This page has been viewed 74 times this month, and 5031 times total. Cartoon Characters: Old Major, Boxer the Cart-Horse, Snowball, Napoleon, Cow, Farmer Jones. How the Brits can match up to the Yanks! Though Animal Farm may lack the moralistic, happy-happy approach Snow White may have had, it delivers it's message more vividly and truly makes it an unforgettable classic. Annoyed with the attitude of Farmer Jones, the pigs lead a revolution and take over the farm for their own. Echoing events in the early USSR or indeed any Communist state, the leaders of the revolution are soon either killed or become more corrupt than the Farmer ever was. 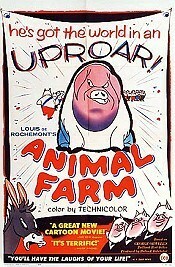 Though some hated it because they were so used to funnies when Animal Farm first came out, it's used worldwide nowadays as a form of anti-Communist propaganda. Even if most toon-addicts are Disneyites or Looney Tunes, I think the British animators deserve a big "well done" for their efforts on this film! 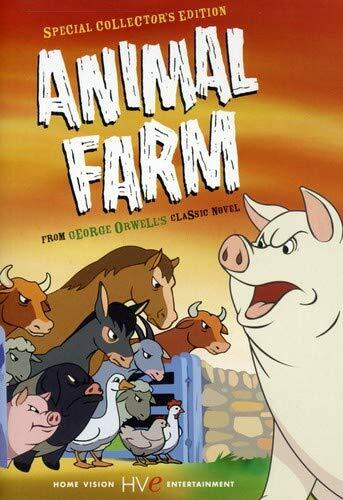 Animal Farm by Big Cartoon DataBase is licensed under a Creative Commons Attribution-NonCommercial-ShareAlike 4.0 International License.